Lally Broch Farm: A Maine Family Homestead: Mazel Tov! 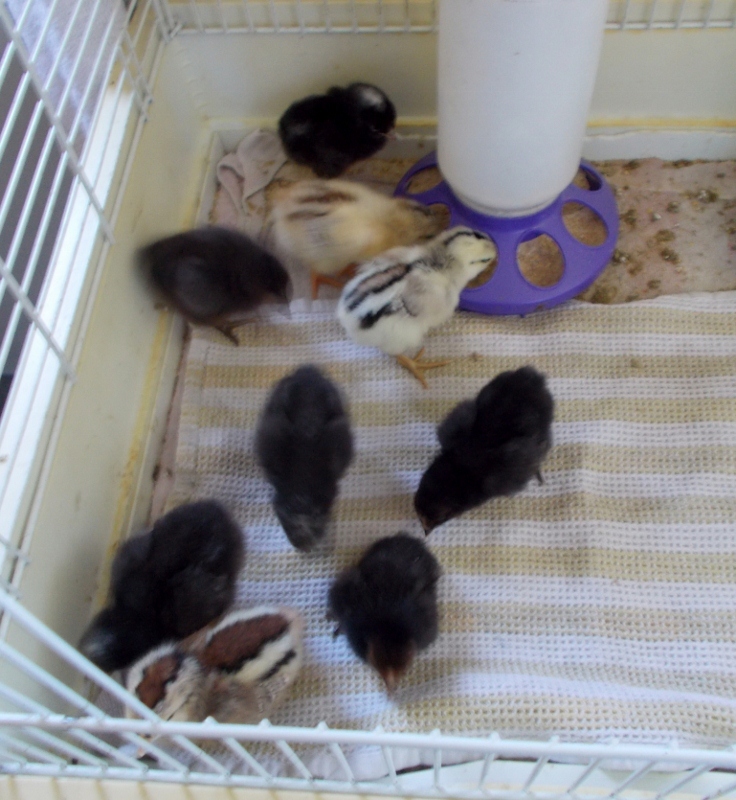 Instead of 8 little fluffy chicks, we now have 9 of them. In the nature versus nurture debate, I think nature wins. Broody Wyandotte was not interested in my checking on her nest this morning and puffed up to scare me away. But, Sean had already told me that their was another chick in the box and I wanted to see it for myself. I am glad I perservered and intruded for a moment to capture this picture. It immediately reminded me of the passage in the Bible recorded at Luke 13:34- "Jerusalem, Jerusalem... how often I wanted to gather your children together in the manner that a hen gathers her brood of chicks under her wings..." Look at how Broody Wyandotte moved to protect her chick from my disturbance. We were up and at it early this morning, so Sean could take my car to work, since his needs to go to the car doctor today. I wanted to get to the store before Sean left for the morning to pick up the borax and lye needed for soap making. Sean wanted me to be happy, so he obliged me in this matter. Before we headed out, Sean checked the nest box and discovered another newly hatched chick. This one, less than 12 hours old- was still very tired and covered in little specks of eggy membrane. He brought the chick inside both to present me with his treasure and because it was only mid 40 degrees outside here this morning. I love this picture. It never stops amazing me how such strong, working hands can be so gentle when they hold mine or how safe and protected I feel in Sean's very capable hands. We thought the warm brooder would be more toasty for the new chick. 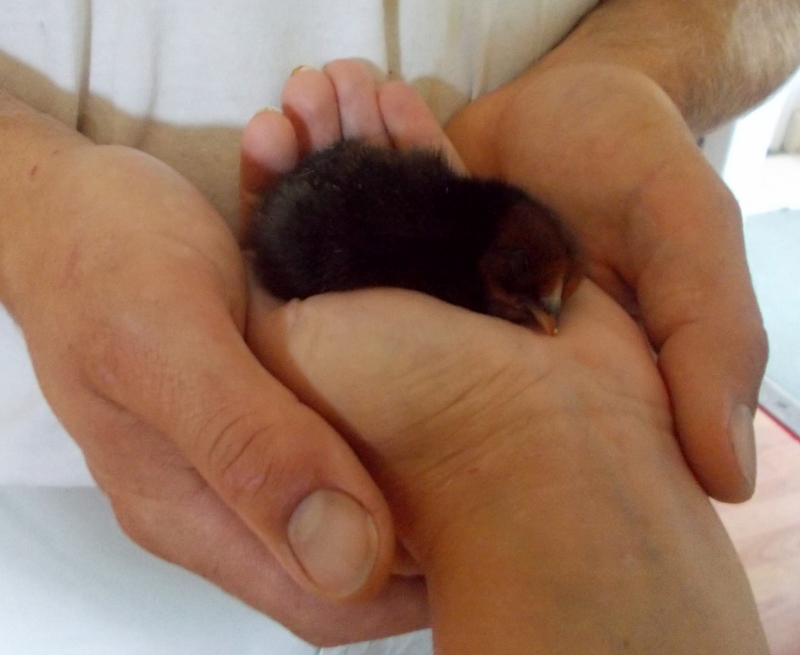 And, it was, but the chick was soooo newly hatched and tired that all it wanted was to curl up and sleep somewhere. 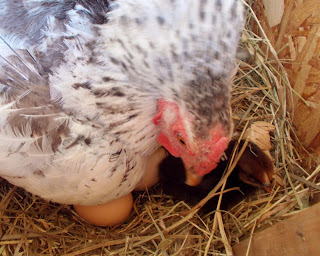 Hard to do with 8 curious siblings determined to say "welcome" via pecking and walking on you. 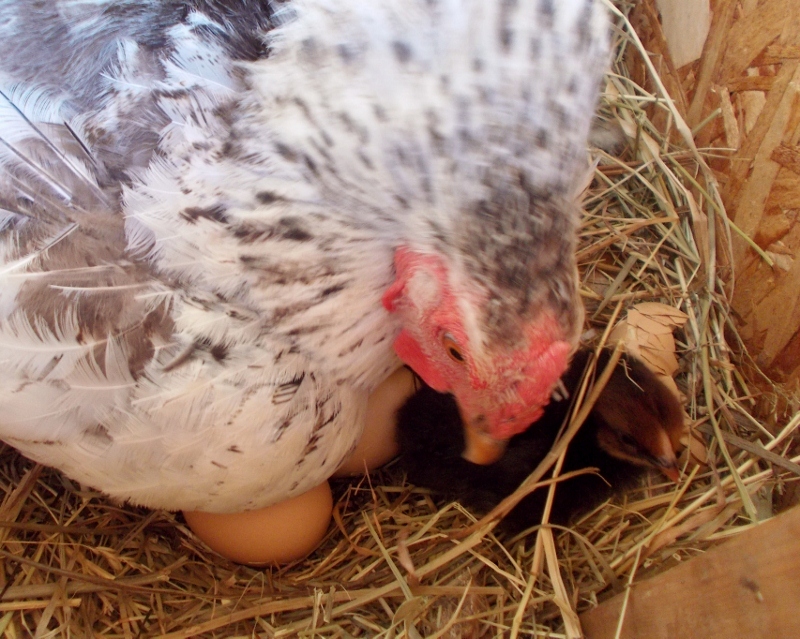 So, the stay inside was short lived; we returned the new chick to underneath Momma's warm and sheltering embrace. Can you spot the new chick? 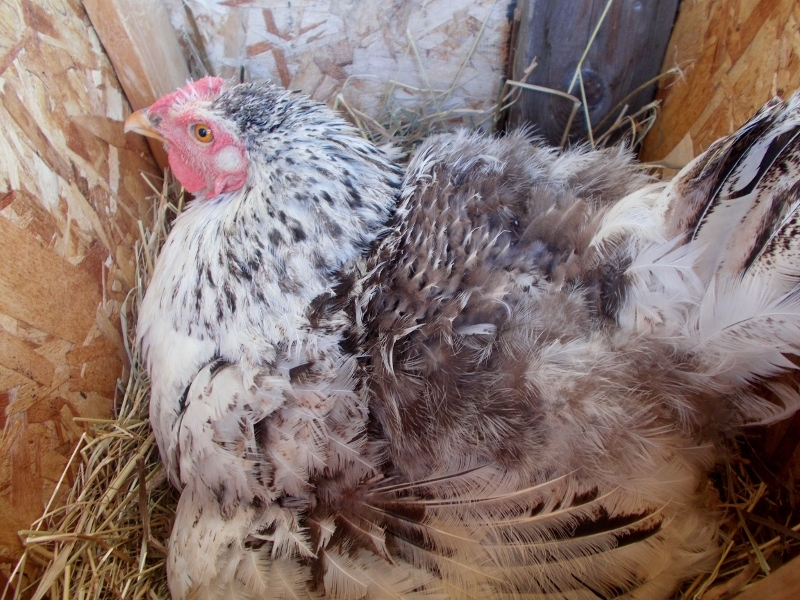 When I checked the chick later in the morning, it had fluffed up and was doing grand. I'll retrieve it before it gets too active to avoid the chance of a mishap. We have 9/20 eggs hatched. That is almost a 50% success and we have 8 more still cookin' away inside their eggs. Now, to post this update and get on with my first attempt at the making of some soap! I have all the ingredients ready. Be sure to check back to see how that goes! I love that picture of the chick in both your hands. So sweet! Good luck with the soap making! That picture needs to be in a frame NOW! I love it! I am sitting over here tearing up. That is beautiful!